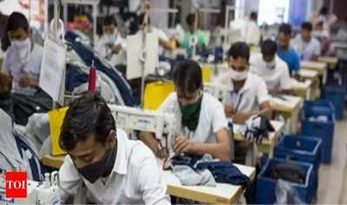 In time of a raging debate over jobless growth, nearly 24 lakh posts are lying vacant with the central and state governments, data compiled from answers to various questions in Parliament show. 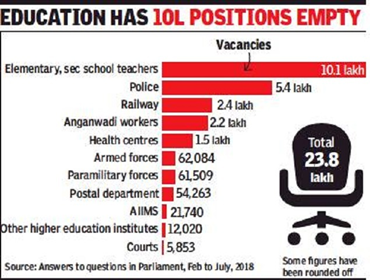 A Rajya Sabha question answered on February 8 shows that the largest chunk is the over 10 lakh vacant positions for teachers in elementary (9 lakh) and secondary schools (1.1 lakh). Apart from the vacancies in the centrally sponsored Sarva Shiksha Abhiyan, which provides assistance to states and Union territories to maintain the desired pupil-teacher ratio under right to education norms, the bulk of these vacancies are in the domain of the states and Union territory administrations. A Lok Sabha question answered on March 27 quoting figures from the Bureau of Police Research & Development stated that there are 4.4 lakh vacancies in civil and district armed police. The same source showed that an additional 90,000-odd positions vacant in state armed police, taking the total vacancy in police forces to 5.4 lakh across the country. Law and order being a state subject, these positions are primarily under the state governments. Incidentally, among major economies, India has one of the lowest police-to-population ratios. This is often held to be a major factor in larger law-and-justice issues like pendency of cases and lower conviction rates because of slapdash investigations done by overburdened police. It is not surprising that the judiciary, with crores of pending cases, is also running well below full strength. A Lok Sabha question answered on July 18 points at over 5,800 vacancies in courts. Answers to Rajya Sabha questions on March 14 and 19 and a Lok Sabha question on April 4 showed that there are over 1.2 lakh vacant positions in the defence services and paramilitary forces. Over 61,000 of these are in paramilitary forces while the aggregate figure for the three defence forces is over 62,000. Then there are 2.5 lakh vacant posts among non-gazetted staff in the railways, the answer to a Rajya Sabha question on March 16 revealed. It, however, stated that two notifications have been issued in February to fill more than 89,000 of these vacancies. A Lok Sabha question answered on March 28 points at over 54,000 vacancies in the postal department, another major government employer. The health sector is another casualty of vacancies in sanctioned positions. A Rajya Sabha question answered on February 6 shows that there are about 1.5 lakh vacancies in these centres. About 16,000 are of doctors or specialists while others include nursing staff.